Teeth are called “impacted” if they fail to erupt and pass through the gums. Teeth that have only partially erupted through the gums are also considered to be impacted teeth. The most common teeth to remain impacted are the third molars (commonly known as wisdom teeth). Impacted wisdom teeth may occur in early adulthood but can arise later in life. Impacted wisdom teeth often are not noticeable because they do not cause many symptoms or pain. After the wisdom teeth, the maxillary cuspid (upper eye tooth, canine tooth) is the second most common tooth to become impacted. If impacted teeth are not treated, an impacted tooth may press against an adjacent tooth, causing a misalignment or shift in your teeth. There are several reasons that a tooth can become impacted and fail to fully erupt. The most common causes of tooth impaction are insufficient space in the jaw and the overcrowding, misalignment, or conflicting position of teeth in the jaw. This misalignment of teeth can cause emerging teeth to tilt or become displaced when attempting to emerge, which contributes to impacted teeth. Located between the incisors and first premolar, cuspid teeth are easily recognizable by their distinctively pointed shape. Cuspid teeth have the longest roots of any human teeth, causing them to be very strong biting teeth. They play an important role in the dental arch because they are the first teeth that touch when your jaws close together, guiding the rest of the teeth into the proper biting position. For most people, the maxillary cuspid teeth are the last of the front teeth to erupt into place. This typically happens between the ages of 11 and 13. What kind of problems can impacted canine teeth cause? Why is early detection of impacted canine teeth important? Early detection of impacted canine teeth is a key element in the success of their treatment. When the eruption path for the impacted canine tooth is cleared by age 11 or 12, it is likely that the impacted canine will erupt on its own. If the impacted canine tooth and its roots are allowed to develop due to delayed detection, treatment will probably require surgery. The farther the patient is into adulthood, the higher the chance the impacted tooth will be fused to the surrounding bone. Once total fusion has occurred, the only treatment option is to extract the impacted canine tooth and insert a dental implant in its place. If the impacted canine tooth fails to erupt spontaneously after an orthodontist has applied braces to the upper teeth and created an opening for its growth, our maxillofacial surgeons will perform a simple surgical procedure to expose and bracket the impacted canine tooth. During this procedure, the gum is lifted to expose the impacted tooth. Our oral surgeon will place an orthodontic bracket with a small gold chain attached to it on the exposed tooth. This chain links the bracket to the orthodontic wire. Once the sutures heal, the patient can return to their orthodontist. A rubber band will be attached to the chain and used to pull the impacted canine tooth into its proper location. A CT scan is often used to locate the impacted tooth, identify adjacent teeth, and determine the best surgical approach. 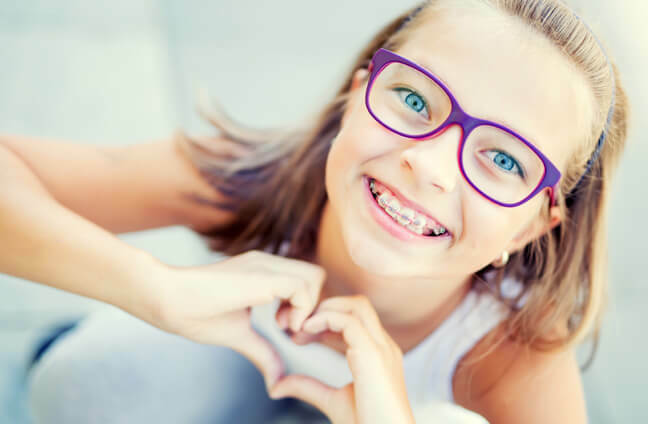 If detected at an early age, a patient may have surgery to expose impacted canine teeth before braces are even applied. Exposing an impacted canine tooth at an early age will promote some eruption to occur before the tooth becomes totally impacted. In most cases, impacted canine teeth can be exposed and bracketed safely and easily in our facility using either nitrous oxide or IV sedation. Surgery to expose and bracket an impacted tooth is generally scheduled for 30 minutes if one tooth is being exposed and bracketed and 60 minutes if both sides require treatment. A preoperative examination will be conducted before your procedure to answer any questions you have regarding your specific case. How long is recovery after impacted canine teeth are exposed and bracketed? As with any surgical procedure, your specific recovery will depend on many factors. Most patients will experience mild discomfort and bleeding after surgery, and you will be limited to a soft diet until the discomfort passes. Our oral surgeons may prescribe antibiotics or pain medications, if necessary, but many patients find Tylenol or Advil to be adequate management for any pain they experience. Our oral surgeons will discuss the details of your surgery and recovery with you before your procedure. How can I find out more about impacted canine teeth? For more information on impacted canine teeth, please contact Staten Island Oral & Maxillofacial Surgery to schedule an appointment with oral and maxillofacial surgeons David Hoffman, D.D.S., F.A.C.S., Lydia J. Lam, D.D.S., Steve Yusupov, D.D.S., M.D., and Mark Stein, D.D.S., M.D. at 718.226.1251.